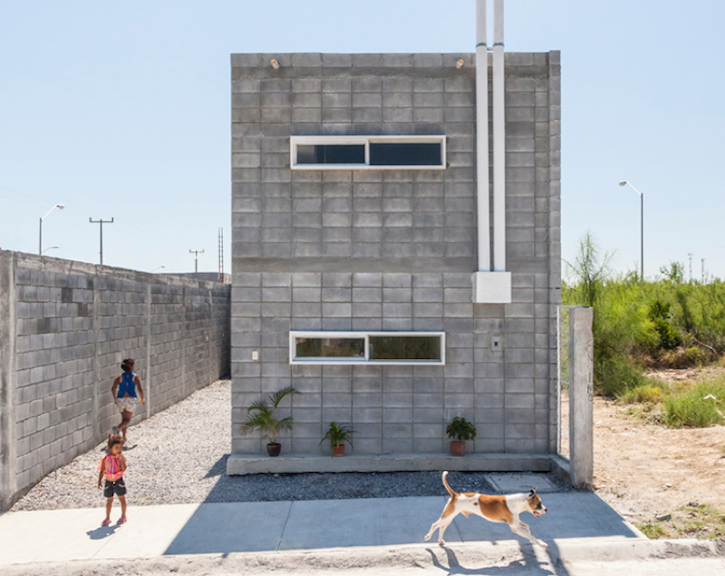 On the outskirts of Monterrey, Mexico, the Galván family recently completed the construction of their first home: la Casa Caja, or the "Box House." For years, the five-member family has lived with friends. 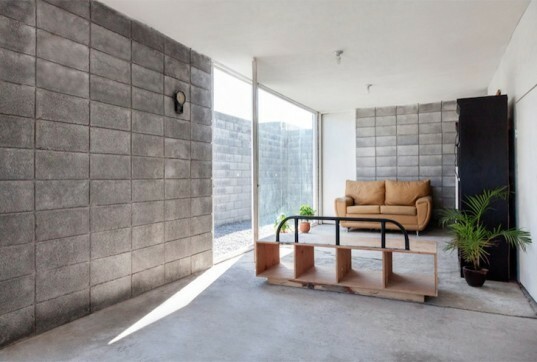 But now, thanks to S-AR Architecture and the nonprofit social housing project Comunidad Vivex, the Galváns have their very own two-level, concrete-block house, which could serve as a model for affordable and sustainable housing in Mexico and beyond. An offshoot of S-AR, Comunidad Vivex aims to combat the shortage of high-quality affordable housing in Mexico by helping low-income construction workers create and customize their own homes. These masons build dwellings for other people but rarely can afford a permanent roof themselves. For Casa Caja, S-AR drew up a design that fits into Mexico’s standard 23-by-49-foot urban sub–plots, and household head Jesús Galván built the property, largely from donated materials supplied by Comunidad Vivex, in collaboration with friends and the local community. By offering training along the way, the nonprofit taught homeowners new skills that they can transfer to future jobs. The “Box House” comprises a series of rectangular compartments nested into one other. The main box was laid in the middle of the site for a ground-floor living and dining area. A sliver of unbuilt land was left for a side yard that offers ventilation, natural light through floor-to-ceiling doors, and excess space for internal activities to spill out onto the gravel. Another box, at one end of the house, contains plumbing and electrical appliances along with a staircase. The emphasis on simple materials—concrete blocks and slabs, plywood, glass, and wooden bars—as well as the reduction in labor meant the house was relatively affordable. The total cost of construction was 150,000 pesos, roughly $10,125 US dollars. S-AR offered templates for room designs and layouts, which the Galváns could use or improve upon depending on their household needs. The furniture in the living room and kitchen, for example, can be stored under the staircase to make space for commercial or productive enterprises. The second level features a living room and two bedrooms for the parents and younger children. An offshoot of S-AR, Comunidad Vivex aims to combat the shortage of high-quality affordable housing in Mexico by helping low-income construction workers create and customize their own homes. Household head Jesús Galván built Casa Caja, largely from donated materials supplied by the nonprofit, in collaboration with the local community. The "Box House" comprises a series of rectangular compartments nested into one other. The main box was laid in the middle of the site for a ground-floor living and dining area. The furniture can be stored under the staircase to make space for commercial or productive enterprises. A sliver of unbuilt land was left for a side yard that offers ventilation, natural light through floor-to-ceiling doors, and excess space for internal activities to spill out onto the gravel. The emphasis on simple materials—concrete blocks and slabs, plywood, glass, and wooden bars—as well as the reduction in labor meant the house was relatively affordable. The total cost of construction was 150,000 pesos, roughly $11,600 US dollars. S-AR offered templates for room designs and layouts, which the Galváns could use or improve upon depending on their household needs. The second level features a living room and two bedrooms for the parents and younger children.